i7™ Hot Start High-Fidelity DNA Polymerase 2x master mix is ready to use premix which contains hot start high-fidelity DNA Polymerase, dNTPs, MgCl2, PCR enhancers and stabilizers with optimized proprietary reaction buffer. 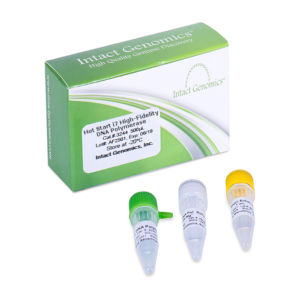 i7™ Hot Start High-Fidelity DNA Polymerase 2x master mix has the high-fidelity, sensitivity and processivity with an error rate ~2.8×102 fold lower than Taq DNA polymerase, and significantly lower than the error rates of other proofreading enzymes. 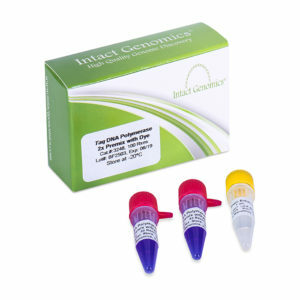 Categories: Enzymes, High Fidelity DNA Polymerases. 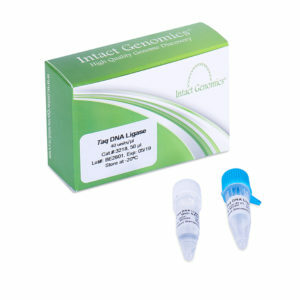 Tags: Hot Start High-Fidelity DNA Polymerase 2X Master Mix, i7™ Hot Start High-Fidelity DNA Polymerase 2X Master Mix. 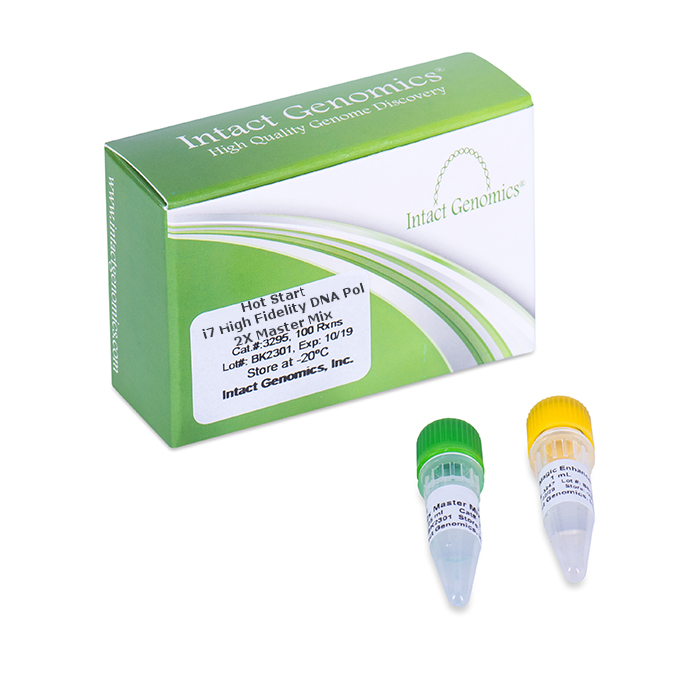 Intact Genomics (IG) Hot Start i7 High-Fidelity DNA Polymerase 2x Master Mix is ready to use premix which contains hot start i7 high-fidelity DNA polymerase, dNTPs, MgCl2, PCR enhancers and stabilizers with optimized proprietary reaction buffer. Hot Start i7 High-Fidelity DNA Polymerase is a chemically engineered, heat stable DNA polymerase which has 5´→3´ polymerase and 3´→5´ exonuclease (proofreading) activities. This enzyme has high-fidelity, sensitivity and processivity with an error rate ~2.8×10^2-fold lower than Taq DNA polymerase, and significantly lower than other proofreading enzymes in the marketplace (1). 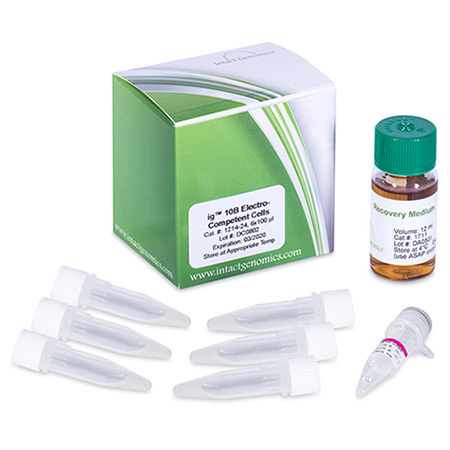 This 2x master mix product is supplied with 5x magic enhancer that enables efficient amplification of GC rich templates up to 84%. 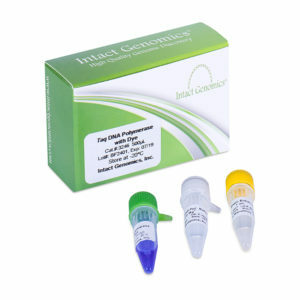 • Efficient for amplifying high GC content template DNA with magic enhancer. 1. Thaw hot start i7 high-fidelity 2x master mix, primer solutions, 5x magic enhancer (if required) and mix thoroughly before use. 2. 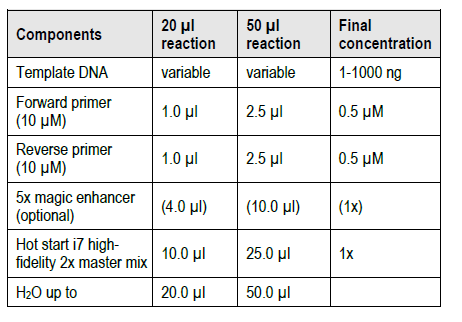 Prepare a reaction mix according to the following table: (The reaction mix typically contains all the components needed for PCR except the template DNA). 3. Mix the reaction mixture thoroughly. 4. 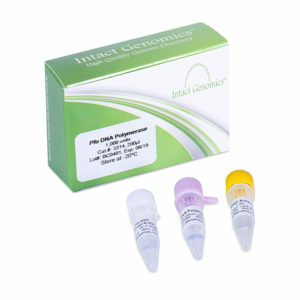 Add template DNA to the individual PCR tube containing the reaction mixture. 5. Program the thermal cycler according to the manufacturer’s instructions. 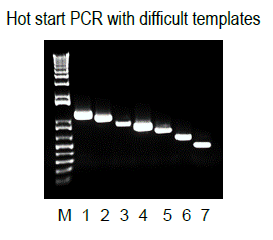 A typical PCR cycling program is outlined in the following table. 6. 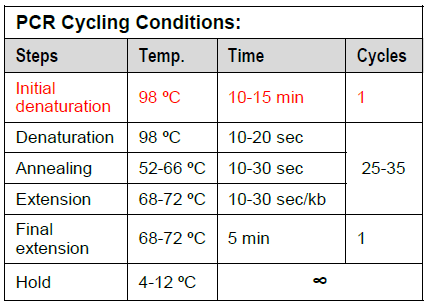 Place the PCR tubes in the thermal cycler and start the cycling program. 1. Frey, B. and Suppman, B. (1995). 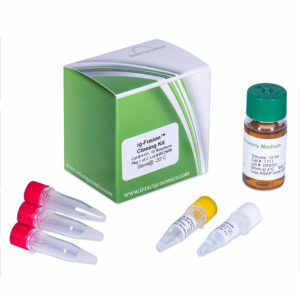 BioChemica. 2, 34-35.